I shared with my doctoral students this past weekend about the power of personal knowledge management (PKM). Specifically, I attempted to address the benefits of having a trusted curation process that is built for the present and the future. The value of having information available to you when you need it is difficult to articulate until people get to experience it for themselves. Part of being overwhelmed by things flying at us seems to be the shutting down anything that isn't immediately demonstrating a pressing need. I've had an Apple Pencil for a little over a month now and really enjoyed seeing the device through Serenity Caldwell‘s eyes. 2) What's really to blame for the failures of our learning management systems? Our institution is currently evaluating a potential change in our learning management system, or at least a substantial upgrade to our existing one. The article cracked me up, since some of the events described in the piece are happening to us as I write this. James Lang is such a wonderful author and gives fabulous advice in this piece. However, this week is primarily made up of exams in my classes and next week is our Spring break. I have captured his ideas in my bookmarking system (Pinboard.in) and will follow up at such a time as when I have an opportunity to try some new approaches in my teaching. I will get more out of his article if I review it, again, when I am able to start experimenting with his suggestions. In the meantime, it has been saved under my teaching bookmarks. The article has been saved under my disability bookmarks and no doubt will prove to be useful when I am working with faculty to have a better sense of why certain accommodations are made for our students. Sharing is an integral part of one's personal knowledge management system. This week, I bookmarked a post with 44 social media tools recommended by pros. While I do get tempted to explore new tools, especially on a week full of grading, I'm staying away for the time being. Having graphics included with social media content increases the likelihood that someone will see and then share your content. If you need some creative ideas for how to use visuals, check out this article from the Social Media Examiner. Canva makes it easy to create a graphic. You can use one of their predefined sizes, or input a custom size. The service is free, though they do have graphics for sale on their site for $1 a piece, so be prepared to upload your own graphics or be sure to restrict yourself to their free options. Buffer is a service that allows you to pre-schedule content to share across all of your social media. I intersperse original content, links to others' blog posts, and quotes from my podcast episode to spread the word even further. Once you have content placed in a schedule, you can drag individual items around to suit your needs. It even has a shuffle button to really mix things up. Despite using an RSS reader daily, there are still occasions where I am at a loss for solid content to post. Nuzzel does the curating for me by looking through who I follow and recommending relevant content. When I first head about Nuzzel, I didn't think it would offer any additional value. I was wrong. Each time I've used the app, it has served up rock-solid content and has done so in a streamlined way. When it comes to new apps, Dave is often a bit more willing to experiment than I am. He's gone back and forth between the two read-it-later services: Pocket and Instapaper, more times than I can count. On the other hand, I made the switch to Pocket upon his suggestion and am not willing to re-learn a new system, just to capitalize on a couple extra features that Instapaper now offers. That's why I think I was so suspicious about making the switch to Pinboard.in. Dave had made the move and kept recommending it to me. At first glance, I wasn't sure how it would be better than the Delicious bookmarking system that I had been using. However, I finally decided to take the plunge when I saw that I could have Pinboard.in bookmark/pin everything both inside their system, but also on my Delicious account. There just wasn't that much to lose. Pinboard is a personal archive for links you find online. You save bookmarks to the site and can find and search them later from any computer. The site can automatically import your links and tweets from a number of outside services. Pinboard also offers an archive feature that will save a local copy of everything you bookmark in case the original page goes offline, and let you search all your bookmarks by their full text content. How do I use Pinboard? Once a week, I go onto my main Pinboard page that has all my pins in one long list down the middle. I take a look at the pins I've added in the last week and determine whether they might fit into my main blog post for the week, or if they might be good individual Tweets or Facebook links. The power of Pinboard comes in when you set up a system of categories, or tags with your bookmarks. As soon as you save a bookmark, you have the option to add one or more tags at that time. Later on, if someone asks me for my advice or resources regarding educational technology, I have an easy link to send them that has all the resources I've saved on a given topic. I have Pinboard set up to automatically add any Tweets that I favorite to my pins. While that sounds like it would get crazy to try to keep all those favorites organized, it really isn't all that necessary. I have it set to use any Twitter hashtags as tags within Pinboard. In most cases, there aren't tags, though, and they just wind up going in a category called untagged. If I were inclined, I could manually go in there and tag them all at a later time. However, I haven't found that necessary, given the robust search features in Pinboard and the nature of the kinds of things I favorite on Twitter. Someone asked me the other day if it was strange listening to myself on podcasts. I'm now doing a monthly Q&A show on Dave's (my husband's) Coaching for Leaders podcast, as well as the weekly Teaching in Higher Ed podcast. I listen to many of them before they air, so that I can create the show notes. All of them wind up in my listening queue on Overcast (my preferred podcast app). My weekly routine has me often listening to them in the car, or when feeding our baby girl at night. There are often moments when I listen where I wish I would have phrased something differently, or not laughed when I talked about something quite serious. Lately, I'm frustrated at the number of times I'm saying the filler word “so” on the show. Prior to that, the recordings were littered with “you know”s. I'm always working on some aspect of my speech patterns that could potentially be distracting to the listening audience. Yes, it can be uncomfortable to hear myself, especially during some of my less-than-stellar recording moments. However, there are so many great things that have come from “working out loud,” a phrase first coined by Bryce Williams. When we work out loud, we make our work visible to a network of people with similar interests and missions as our own. …making your work visible in such a way that it might help others. When you do that – when you work in a more open, connected way – you can build a purposeful network that makes you more effective and provides access to more opportunities. It is risky and takes dedication to work out loud, but the benefits are plentiful. How do we know when we have truly gained the trust of a colleague in academia? For some of you, it may be when you are asked for advice. For others, perhaps it is when your help is requested. For me, it seems to be when people are willing to confess that they have become digital hoarders. This first happened about four years ago. My friend admitted that she had been letting people down and not following through with her commitments. Let's call her Laura. I'll admit to having been sometimes frustrated that she didn't get back to me on stuff, since we were on committees together and our paths crossed regularly in our work. It was easy to forgive her, though, because I know Laura cared so much and had so much on her plate. What I didn't realize at the time was her big secret as to why she was getting increasingly worse at managing her life as a professor. We were in my office and she finally broke down and cried one day. Laura had forgotten about a meeting she was supposed to attend and had no idea how on earth she was going to get things together for an end-of-the-year event. She said she just couldn't keep up with it all, particularly the email. We talked around the issue for a few minutes, but then got to the heart of the matter. She had more than 7,000 emails in her inbox, much of which she associated with unfinished business. The costs of having a lot of digital clutter aren't immediately evident. Storage costs for data have come down so much that IT departments keep raising the storage they make available to us and it is easy for us to buy another hard drive or sign up for another cloud service. The costs come when we think about how much time we spend trying to find what we need, or having to start over again with something. There's also the stress of having a system we don't trust. As a part of a doctoral class that I’m teaching, we’ve been engaging in the subject of personal knowledge management (PKM). I created three modules for the course, which I’ve made available to anyone who cares to watch, in the open spirit of PKM. The doctoral cohort is beginning to explore PKM on their own, now. They have found some terrific blogs and articles on the subject, which really exemplifies the positive attributes of the final stage of PKM. Below are some of the articles they shared that caught my attention. “Being able to work out loud allows employees to make connections – finding people and content relevant to their work – like never before. (Stepper, 2012). While I link to many articles and videos by Harold Jarche in the class, this is one I hadn’t referenced. The student who posted it said it really filled in the holes for her and helped bring new understanding to the practice of PKM. Jarche argues why PKM is essential in today’s networked era. Work is no longer standardized, but instead customized, and requires people to “constantly improve their talents and focus on initiative and creativity” (Jarche, 2014). 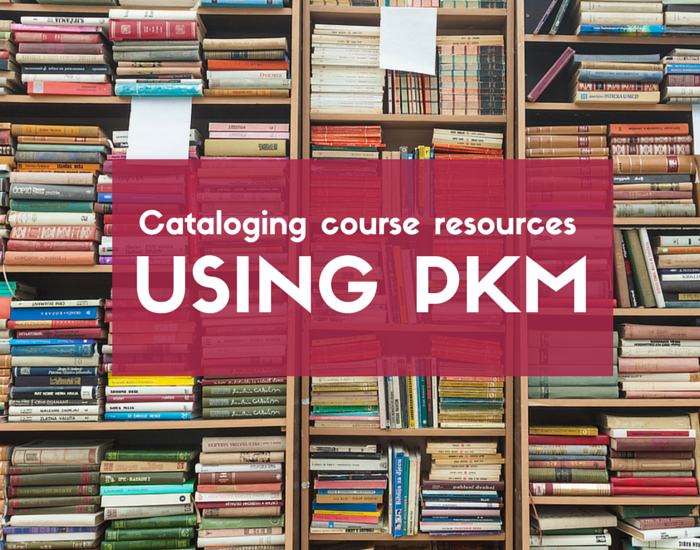 Let me know if you have any good resources on PKM in your archives, or if you enjoyed watching the online modules.